Memory foam had an auspicious debut as it was initially introduced for NASA’s exclusive use only. The material’s design and performance, however, made it ideal for other purposes other than just the for the convenience and comfort of pilot seats and other aircraft related things. Before long, it became a fantastic medical solution in providing pain reliefs for patients with various neck or shoulder pains. Since then, it has started finding its place in the home of thousands of people. Pillows made out of memory foams are surging in popularity because of its numerous benefits. Aside from its cushioning, people have often been amazed at the kind of support it gives to people. 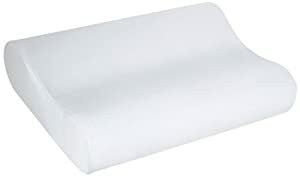 This is the kind of foam that can really make those aches and nagging pains go away, especially when going to bed. The Sleep Innovations Contour Memory Foam Pillow does all these for the user and more. As an exclamation point, the orthopedic design takes its cue from the aforementioned medical purposes, which really does an incredible job of providing support and cushioning in all the right places. Encourages the correct spinal alignment that can help a person get a restful sleep. Eases pressure on various parts of the body and alleviates pain. The unique Sure Temp Memory Foam holds the contoured shape from the moment a person sleeps until waking up. 5-Year Warranty against factory defects. The right positioning, as encouraged by the use of this pillow, can do a lot of things for the person. When a person sleeps in the right position, he or she is able to relieve the stress and pain in various parts of the body such as the neck and shoulders. A healthy position during sleeping can make the sleeper energetic after a very comfortable rest at night. The design is medically-based and is claimed to help people with various sleeping disorders like snoring. Since memory foam is a material that has the history and even continued medical use, it has the proven track record of helping people achieve a healthy way of getting a comfortable and pain-free sleep. Many experts believe that a 3-pound density is the perfect weight that delivers the right amount of support and cushioning during sleep. A memory foam of this density dispenses the weight of the user evenly, which creates a much effective way of easing the pressure points. It has a very good chance of relieving pain and tension. A person spends around 6 to 8 hours of sleep, which would be disastrous if the pillow is a melting pot of substances that cause allergies. The hypoallergenic feature of this pillow makes it comfortable and safe for the user. Also, the foam is resistant to dust mites. The Sure Temp Memory Foam holds up very well throughout the user’s sleep. One does not have to continually shift around all night looking for that right position as the pillow maintains the contoured shape. Airing a product made of memory foam is practically a ritual that has to be done to remove the oftentimes horrible smell. The smell can also be very subjective as there are those who find the smell associated with these products as merely something noticeable while others find it nauseating. For some reason, comments found online point out that the smell takes longer to eliminate compared to other memory foam products. It is probably the reason why the manufacturer suggests using Lysol on it to remove the stench quickly. The varying inches found in the foam make it very versatile as basically all kinds of sleepers can find comfort and support in this pillow. Others have also noted that this pillow is something else when it comes to lift. The Sure Temp Memory Foam is precisely as marketed since it really holds up well during the entire duration of a person’s sleep.